2019 is not long away you might be thinking about some unique Irish baby girl names. With so many amazing Irish mammies will be expecting an Irish baby girl in 2019, I put together this short list and their meanings. To give you some inspiration for when the time comes to make that all important decision. 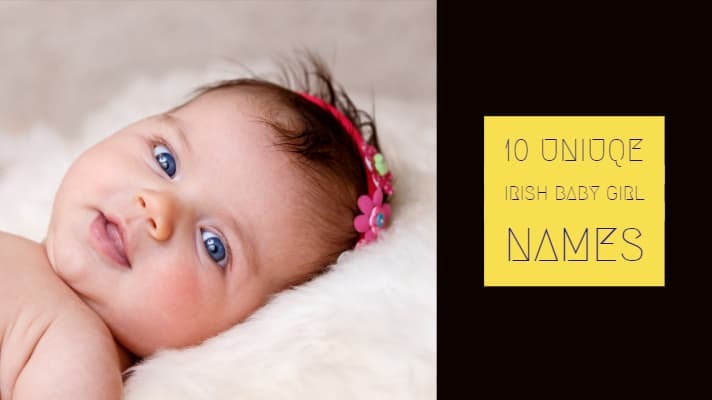 Without further ado let’s get to our top 10 unique Irish baby girl names. Don’t worry if you are having a boy I will have a post on that soon. These Irish baby girl names are in no particular order. Mab – Short and sweet. In Irish, the meaning of the name Mab is Happiness. Sorcha – Sorcha is thought of as the Irish version of ‘Sarah’, although it literally means ‘radiant. In Irish the meaning of the name Sorcha is Bright; intelligent. Sorcha is often confused with the highly popular name Saoirse. The two are different names entirely, however; Saoirse actually means ‘freedom’! Ceara – Even though the pronunciation of Ceara and the more usual Ciara is KEER-a, most Americans would tend to mispronounce this spelling variation as Sierra. Meaning in Irish, “little dark one”. Oona – In Irish the meaning of the name Oona is Lamb. Can also be an Irish Una: meaning the one. Riona – A simplified form of the name ‘Rioghnach’, this literally means ‘queen-like’. In Irish legend, the wife of the renowned king Niall (of the Nine Hostages fame) was known by the name Rioghnach. It is also sometimes seen as a shortened form of Catriona, the Irish version of Catherine. Fia — Fia and its Irish version Fiadh are among the fastest-rising girls’ names in Ireland yet are virtually unknown in the U.S. It means “wild deer” but might also be a short form for Sofia. Orla(popular) — This adorable name means “golden princess” was as popular in medieval Ireland as it is today. Breanna – The meaning of the name “Breanna” is: “Noble, strong, virtuous; hill”. Which one of these Irish baby girl names is your favourite? You can pin the image below to your Pinterest board to refer back to them later. Hope you enjoyed this post if you did be sure to hit that share button. Get your weekly dose of Irish straight to your inbox register here or like us on Facebook.